Ok, so I have had enough time off since my Tool: OSConfig (Preview) to finish the script and do some initial testing (as well as enjoying Thanksgiving break). If you read through the Preview, and my Tool: OSConfig (Preview) Why? post, then let’s just get started on where to go. Once you have completed the download, unpack the zip. 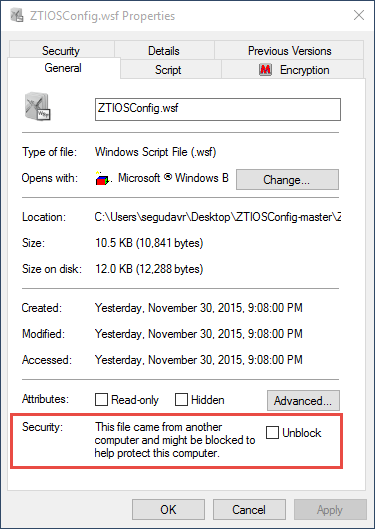 Since these files were downloaded over the Internet, you will need to Unblock them. You can painfully choose to do this individually, or download Sysinternals Streams to do this for you. A better option would be to download GitHub Desktop and Clone my Repository so you don’t have to worry about unblocking the files.